Adjustable banner stand back walls are a great graphic display solution for exhibitors who need to utilize different size booth spaces. These displays are designed to act as a graphic backdrop so you can push the stand all the way into the back of your booth space maximizing your trade show booths square footage. We offer multiple sizes to fit any size booth including a Jumbo back wall that can adjust up to 12' wide by 12' high! 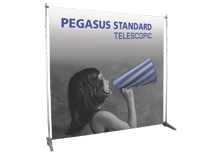 All of our banner stand back walls are designed to maximize versatility and portability. 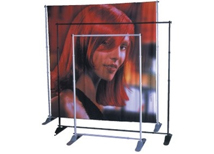 They are also a very affordable graphic display solution compared to other trade show displays. 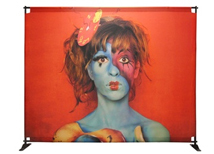 All graphics are printed in the USA for fast turnaround and high quality. The 13 oz. 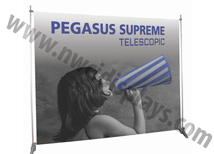 vinyl used on these banner stands is curl resistant and very durable. All hardware is imported but completely quality controlled in the US resulting in extremely low defect rates! There is a 1 year warranty on hardware to protect from any manufacturing defects.